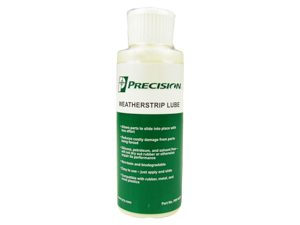 Precision's weatherstrip lube significantly reduces friction, thereby reducing the installation force required to assemble parts & fittings. Helps to avoid injuries related to slippage and repetitive stress, reduces rejects, and improves product performance. Use it to install automotive weatherstrip, grommets, O-rings, hoses, tires, seals, plugs, and any rubber or soft plastic parts. Compatible with rubber, metal and most plastics. Comes in a 4oz bottle.